Touchscreen technology has really changed the way we use computers and how computing is done. Tactile manipulation, control and feedback brings an added dimension to how we interface with computers. This is most apparent with how easily we use tablets and how intuitive it is. Transporting that level of control to desktops have been done before but hasn’t gained traction yet. But an electronics company is banking on their product to get more attention from the buying public. The Telkin Touchscreen PC has been designed from the ground up to cater to people who do not possess a lot of techonological skills to operate desktop PCs. 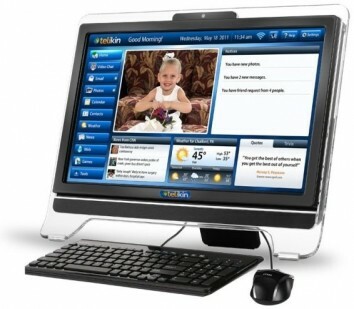 What the Telkin Touchscreen PC is, is a touchscreen computer that runs a customized proprietary operating system. Yes, this baby doesn’t run Microsoft Windows. The Telkin Touchscreen PC takes a page out of Apple’s book by selling a machine that works right out of the box. It also comes preloaded with software that most people use on desktop PCs – email, calendar, video chat, photo sharing, news, address book, weather and a web browsing software. Of course, it also has games like blackjack and solitaire. The operating system’s GUI has also been designed for ease of use. It is not cluttered and everything is easy to find. One cool feature of the Telkin Touchscreen PC is their version of remote sharing. Its feature, called Tech Buddy, allows for another person to access the computer and then basically teach or guide the Telkin user remotely. This is a great feature and shows that the guys who made this PC never lost sight of their target market. Of course, the touchscreen display only makes it so much easier to use especially for those oldies who really can’t come to grips with a mouse and a cursor. If you’re planning to gift your grandparents a computer then this is your best option.